Is The Grove's Holiday Tree a Fake? You know you're in LA when even the trees are airbrushed. 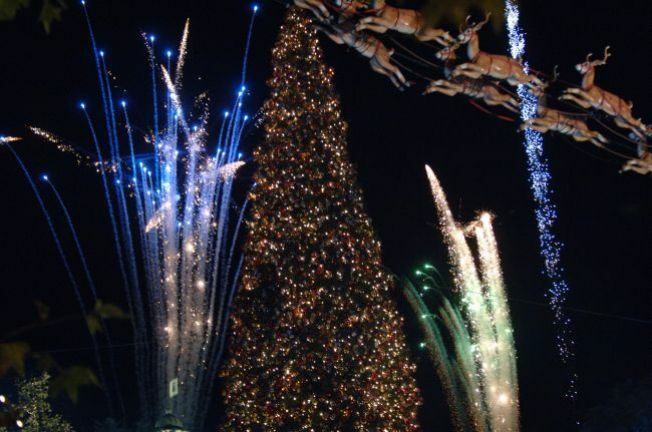 The Grove pulls out all the stops for its annual tree-lighting ceremony. No detail is spared, including reindeer and an occasional light dusting of snow. Man, that was fast! Thanksgiving aromas haven't even hinted at wafting yet and the city's already gearing up for The Holidays. Heck, we're still begging, pleading with friends, colleagues, annoyingly thin people to take away our Halloween candy or we'll have to trick-or-treat as Fat Santa next year. The Grove, in a Disney-fied tizzy of holiday preparedness, is already constructing its gargantuan tree for next weekend's ceremonial lighting. That's right, constructing. To perfect its towering 110-foot stature, the tree must be assembled out of multiple trees. It's Fran ken-tree. A giant trunk serves as the base for carefully selected branches that are attached just so to achieve that perfectly triangular, plump yet majestic shape. Is it true they spray-paint it to ensure an even evergreen tone? We're not sure, but the folks at Losanjealous are so bemused they wrote a jolly ode to the Grove tree. Fake or not, we're intrigued. Lights go on Sunday, November 23. Bring your holiday cheer -- there are usually Franken-fireworks and Franken-stars.